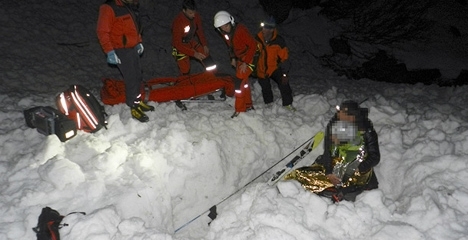 An Austrian man survived being buried under a massive avalanche in Gschnitztal, Tyrol, for ten hours on Sunday.His companion, a 27-year-old German man, died but a rescue team managed to dig out the 23-year-old Austrian alive and conscious, after he had been buried under 1.5 metres of snow. The young man from Upper Austria is making a good recovery, police said on Monday. The pair were reported missing at around 6:45pm on Sunday. One of the men’s families raised the alarm after they failed to return home for lunch, as expected, and couldn’t be reached by phone. A helicopter search team spotted a fresh avalanche in the Sandesalm area, at an altitude of around 1,900 meters. The avalanche covered an area around 400 meters long and 200 meters wide. “We didn’t think that anyone would have survived such a powerful avalanche,” helicopter pilot Helmut Metzler told the Austria Press Agency. A rescue team was able to locate the two skiers. The older man was dead when they pulled him out of the snow but the younger man was alive and talking. Police said it was almost a miracle that he had been able to survive for so long under the snow. He was flown to hospital in Innsbruck at around 9pm that evening and was reported to be in a stable condition on Monday morning. He is being treated for hypothermia.